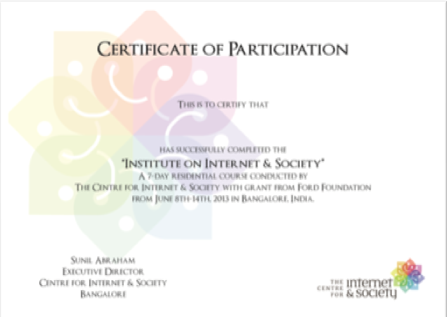 The Institute on Internet and Society organized by the Centre for Internet and Society (CIS) with grant supported by the Ford Foundation took place from June 8 to 14, 2013 at the Golden Palms Resort in Bangalore. A total of 20 participants spent the seven days in a residential institute, learning about the fundamental technologies of the Internet and topics on which CIS has expertise on such as Accessibility, Openness, Privacy, Digital Natives and Internet Governance. The participants belonged to various stakeholder groups and it provided a common forum (first of its kind in India) to discuss and share ideas. Twenty-four expert speakers from various domains came to share their knowledge and speak about their work, so as to encourage activity in the field and supply resources from which participants could learn to increase their accessibility, range and funding possibilities, as well as network with the speakers and amongst themselves. The Institute has triggered a number of follow-up events — those that the participants organized themselves with the help of CIS staff, including Crypto Parties in Bangalore, Delhi and Mumbai, that taught netizens to keep their online communication private. In addition to that, the CIS Access2Knowledge (A2K) team could rope in eight new Wikipedians who will contribute to Wikipedia in Indic languages. The seven day residential Institute began on Saturday, the 8th of June with a warm welcome by Dr. Ravina Aggarwal and Dr. Nirmita Narasimhan. They outlined the purpose of the residential institute and briefly went over the topics which would get covered over the week long duration. This was followed by each of the participants introducing themselves briefly and also stating their expectations from the Institute, why they were attending the same and what they hope to get at the end. the first session on Day 1. The Institute proceedings kicked off with the first session, History of the Internet by Pranesh Prakash and Bernadette Längle. Participants learned where the Internet originally came from and how it is organized, as well as different technologies surrounding the Internet. Pranesh Prakash and Bernadette Längle set the start point of the Internet in the late 50's when the Russians send the first satellite in space (Sputnik) and the US founded the DARPA(Defense Advanced Research Projects Agency), a research agency that was tasked with creating new technologies for military use. DARPA is credited with development of many technologies which have had a major effect on the world, including computer networking, as well as NLS, which was both the first hypertext system, and an important precursor to the contemporary ubiquitous graphical user interface (GUI). A few years later the first four computers were connected to a network. After the Network Control Protocol (NCP, later replaced by the TCP/IP) was invented in 1970, the first applications were made: email (connecting people), telnet (connecting computers) and the file transport protocol (FTP) (connecting information) — all of these are still in use today. Participants were surprised to learn that the Web, most commonly used today, known to be invented by one single person in the 90's, actually existed for a long time prior to the '90s. Rather than co-operating, the different agencies compete with each other. Communication with the public is of different degrees and openness of different agencies varies. Department of Electronics and Information Technology (DEITY), is one of the most important public agencies & the CERT-in focuses on issues like malware and content regulation. There is also the STQC (Standard Setting and Quality Setting Body). The work of these organizations is to govern the Internet, bring about better privacy policies and ensure freedom of speech. Other governing bodies include DOT (Department of Telecommunications) which governs the telecom and internet policies of India. In India, certain content regulation takes place under a notification as part of the IT Act, 2003. TRAI (Telecom Regulatory Authority of India) also looks into the tariff, interconnections and quality of telecom sector, spectrum regulation and so on. The USOF (Universal Service Obligation Fund) seeks to provide funds for setting up telecom services in rural areas. Ministry of Information and Broadcasting (MIB) has been extending copyright restrictions to online publications. In 1995, the VSNL provided internet in 4 metros of India, by 1998 DOT had provided internet in 42 cities. Some of the facilities internet provides include Tele-education, Tele-medicine, mobile banking, payment of bills via mobile internet, etc. BSNL has got maximum broadband market share in India. Present Scenario, there are 900 million mobiles in India, 430 million wireless connections with capability to access data. The total broadband connections are 15 million in country, 10 million provided by BSNL. Total internet users are 120 million with a growth rate of 30%. Public access is not only about network intermediaries but about info-mediaries who understand internet. BSNL lost Rs 18,000 crores from 3G license. 2G to 3G shifting is not seamless and leads to lot of packet loss, and 3G coverage is not as extensive as 2G. Thus 3G is not efficient however; the government has made a lot of money from selling 3G licenses. Future trends include technology trends for internet access, optical fiber technologies, fiber to the curb, fibre to the home, metro Ethernet, etc. Internet has created an online Public sphere. In 2000 Parliament passed the Information Technology Act 2000 and the dot.com boom is seen. Status of internet access today sees low level of overall penetration of internet, high rate of household mobile penetration and huge rural-urban divide in internet access. 8.4% of women in India have access to internet in India and 43% of women using internet in India perceived it as being an important part of their life. Some area of concerns include ensuring adequate access of internet for the women, entrenched patriarchies, contextual relevance, the imaginary of ‘public access’. ICT-enabled micro-enterprises may also force the burden of double work on women, who undertake both productive activities for the micro-enterprise and re/productive activities for the household. The Internet today has created an online public sphere. Countering the threat of online violence. 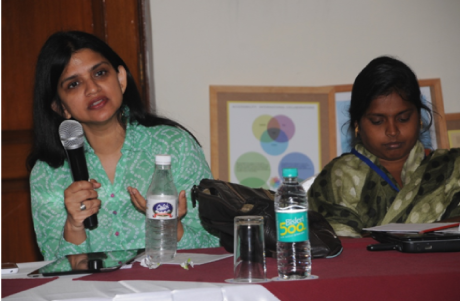 Women’s rights and the spaces of internet governance. Arbitrary censorship and self-regulation by the corporate and slide towards an illusory freedom; state is used as a bogeyman by corporate to create an online culture that is suitable to the corporate values. Day 1 featured an interesting activity called the Creative Handshake. The goal of the game was to teach the participants the concept of "Handshake" in Internet terms and why it is important to make sure that integrity of data transferred is maintained. The focus of the second day was more on the nuts and bolts behind the working of the Internet by Dr. Nadeem Akhtar, Wireless Technologies and a case-study in Air Jaldi by Michael Ginguld, Collaborative Knowledge base building by Vishnu Vardhan and Affordable Devices on the Internet by Ravikiran Annaswamy. The salient points of each of the talks are listed below. Data Networks comprise of set of nodes, connected by transmission links, for exchange of data between nodes. Some of the key principles which underpin data networks include digital transmission, multiplexing and data forwarding/routing. Data networks through ownership include public and private networks. Data networks through coverage include local area networks (small area), metro area networks (may comprise of a city) and wide area networks (wide geographic area across cities). Open systems interconnection (OSI) model divides a communication system into smaller parts. Each part is referred to as a layer. Similar communication functions are grouped into logical layers. OSI model defines the different stages that data must go through to travel from one device to another over a network & this enables a modular approach towards developing complex system functionality i.e. functionality at layer X does not depend on how layer Y is implemented. Internet backbone refers to the principal data routes between large, strategically interconnected networks and core routers on the internet and these data routes are hosted by commercial, government, academic and other high-capacity network centers, the internet exchange points and network access points. The internet back bone is decentralized. Transit Service - Passing information from small ISP to large ISP. Peering Service - The passing of information between two similar ISP’s os similar size to let network traffic pass. Three levels of network Tier1, Tier2 and Tier 3. TATA Company is the only Tier 1 Indian Company. Backhaul- Transport Links which connects access edge networks with the ‘core’ network. The transmitters have to be mounted on a high level. Cons: limited resources, maintenance (energy), physical limitations to transfer rates. Satellite/VSAT is a very small aperture tech: a small satellite dish that connects to a geo-static satellite. Strength: globally usable, can connect from anywhere. Weakness: signal problems, relatively high installation charge, upstream connection is lower than the downstream, transmitter on satellite is extremely expensive, hence limitation on transmission capacity of the satellite. VSATs are not scalable. It is a dead-end tech for usages where data transmission volume is expected to grow. 2G Technology for mobile connection. Limitation in transfer of data, due to technology and encryption limitations but great availability and reasonable price. 3G Technology has a problem in India; low uptake, leading to low investment, leading to low speed, leading to low uptake. The technology allows for high-speed data transfer but the market condition in India still does not make adequate infrastructural support feasible. A company bought the country-wide 4G license in the auction. Mukesh Ambani bought the company after some days. The present legislation does not allow for VoIP-based Telco operation but that is expected to change soon. Wifi technology is wireless technology. It is low cost wireless transfer of data. The Public dissemination of the ranges in which data transfer using the WiFi protocol can take place. It was made public in India in January 2005. Limitations: needs line of sight, limit to data transfer. Strength: cheap, de-licensed spectrum usage, easily deployable. 2G spectrum, 3G spectrum and now 4G spectrum all are part of the wireless technology. Air Jaldi started in Dharamshala; building wifi connection spanning campuses. Three types of consumer categories: (1) no coverage, (2) under-served, and (3) ‘deserving clients’. #2 is the most common group. #3 are people who should be served but cannot pay fully for the service, hence are cross-subsidised by group #2. Deployed and managed by local staff, trained by AirJaldi. Customer premise equipment: Rs. 3-4k. User charges: Rs 975 per month for 512 kbps, Rs 1500 per month for 1 mbps. Content: by and large, AirJaldi brings infrastructure on which content can ride on, teams with various content providers (like e-learning, rural BPOs, local e-banking etc) for the content side. The biggest drivers are local BPO, banking and retail. The next big driver coming up is entertainment. The session started off with some physical activity in the form of "Kasa Kasa Warte, Chan Chan Warte" to break off the lunch induced sleep and a mental activity where the participants were divided into two groups and both the groups were asked to collect information on "Water". One group was left to itself while the other had some expert inputs from Vishnu Vardhan on how to collaborate and organize the data. After the activity, both teams presented the information that they had collected on "Water". The benefits of collaborative authoring such as "everyone's voice is heard", "various inputs leading to a multi-dimensional thinking" etc were evident as against a single dimensional thought process that was seen from the group that was un-assisted. In 1994 Cunningham developed the ‘Wiki Wiki Web’ also known as the ‘Ward Wiki’. Basically it is a knowledge platform. Internet since then has been used for dissemination of information especially in the education sector. Digital Archived have developed over the years which provide information across various platforms like Wikipedia. The spread of the internet has made possible the building of knowledge bases by seamless and mass collaboration. Relative lack of research/academic standards, which is transferred on to Indic wikipedias. Lack of knowledge sharing culture. Building a mass knowledge platform is the need of the hour. The platform should be user friendly, easily available and adoptable; offline outreach is key to effective use of online platforms. The programme should have feedback loop key, behavior statistics data, reinvent and replicate the programme, multi-channel awareness, ‘user connect’ programmes. The people should communicate knowledge sharing objectives, make knowledge sharing fun, appoint ambassadors; virtual volunteer community building looks simple but its complex and leads to failure. 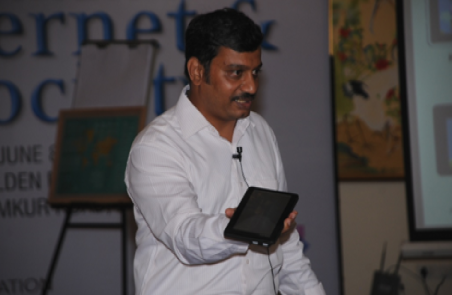 Given above is a picture of the speaker Ravikiran Annaswamy giving a demo of the low cost Akash tablet. Overview of Affordable Mobile Phones such as Lava Iris, Karbonn A1, Nokia Asha, etc. Overview of Affordable Tablets such as Aakash, Ubislate, Karbonn Smart A34, etc. The number of Internet users in India is expected to nearly triple from 125 million in 2011 to 330 million by 2016, says a report by Boston Consulting Group. How Internet Penetration impacts society. Sugata Mitra & Arvind Eye Care examples. The third day of the Institute focussed on Wired means of accessing the Internet, the technology involved followed by an assignment time where the participants were introduced to 2 topics and asked to work on an assignment. This was followed by a site visit in the afternoon to MapUnity. MapUnity develops technology to tackle social problems and development challenges. Their GIS, MIS and mobile technologies are used mostly by government departments and civil society organisations and in the R&D initiatives of commercial ventures. A family of computer networking technologies for LANs which was Invented in 1973 and commercially introduced in 1980. The systems communicating over ethernet divide a stream o data into individual packets called frames. Each frame contains source and destination addresses and error-checking data so that damaged data can be detected and re-transmitted. DSL uses existing telephone lines to transport data to internet subscribers and the term xDSL is used to refer to a number of similar yet competing forms of DSL technologies which includes ADSL, SDSL, HDSL, HDSL-2, G.SHDL, IDSL, and VDSL. DSL service is delivered simultaneously with wired telephone service on the same telephone line and this is possible because DSL uses higher frequency bands for data. ADSL is the most commonly installed technology and an ADSL tech can provide maximum downstream speeds of up to 8 mbps. Modem is de/modulator, it takes bits coming from one protocol/technology, demodulates it (converts it into original data), and re-modulated the original data to another protocol/technology. Router allows creation of a local area network, allowing multiple devices to connect to the network and access internet together through the router. It has very high bitrate DSL (VDSL) and goes up to 52 mbps downstream and 16 mbps upstream. The length of the physical connection is limited to 300 meters and the second generation VDSL (CDSL2) provides data rates up to 100 mbps simultaneously in both direction, but maximum available bit rate is still achieved about 300 meters. Cable access tech is built for one-way transmission; hence some congestion takes place for bi-way data transfer, leading to much lower upstream connection relative to downstream connection for data. Provides very high data rates at long distances. When network links run over several 1000s of meters (e.g., metro area networks), fiber significantly outperforms copper. Replacing at least part of these links with fiber shortens the remaining copper segments and allows them to run much faster. The data rate of a fiber link is typically limited by the terminal equipment rather than the fiber itself. 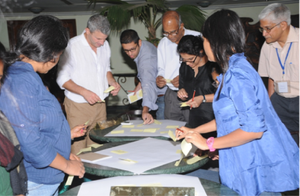 Participants were given two options for an assignment to work on in the coming days and they could choose either one. Your NGO is committed to the task of facilitating access to the Internet for women/ persons with disabilities in rural parts of Kerala and wishes to submit a proposal/ project idea in partnership with a service provider to the USOF. You are a member of the ancient tribe of Meithis residing in Manipur. Over the years, there is a strong feeling in your community that although the Government has rolled out projects to connect the rural areas throughout India, these have not been successful for your tribe and there is still even a lack of basic fixed telephony, let alone mobile and broadband services. You have hence come to the conclusion that there is a need for focused efforts to target such communities as yours and have decided to submit a concept note to the USOF requesting that ‘ethnic and rural tribal communities’ be specifically included within the mandate of the USOF’s activities by defining them as an ‘underserved community’. Given above is a picture of the participants engaged in a discussion. Field Trip - Destination: MapUnity. MapUnity develops technology to tackle social problems and development challenges. Their GIS, MIS and mobile technologies are used mostly by government departments and civil society organisations, and in the R&D initiatives of commercial ventures. MapUnity presented their product offerings to the participants. 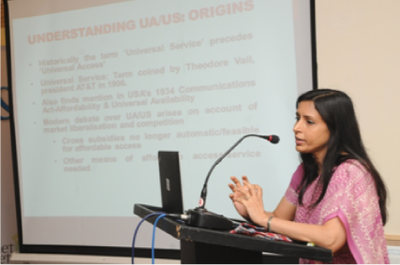 Given above is a picture of Archana Gulati speaking on Universal Access. Tuesday revolved around questions of access and openness. The day kicked off with Archana Gulati, a policy expert in access to ICTs for people with disabilities talking on Universal Access. Ms. Gulati stressed the importance of ICTs for social development. ICTs are a necessary aid in development structures including education, health and increased citizen participation in national affairs & they provide crucial knowledge inputs into productive activities. However, even with the Telecom boom, there still exists an access gap in India, which cannot be covered by commercially viable systems. This 'actual access gap' exists because of geographic (scattered population, low income, low perceived utility of service, lack of commercial/industrial customers, lack of roads, power, difficult terrain, insurgency), economic (urban poor) and social inequality (gender, disabilities) differences. To achieve Universal Access or Universal Service, additional efforts must be made, so as to include these groups. However, Universal Access and Universal Service, while they may imply the same thing, are very different approaches to deal with the problematic access gap. Universal service, a term coined by Theodore Vail, president of AT&T in 1906, argued that the government should enforce the usage of only one network. This approach suggests a monopolization of the market and goes against the liberal market principle. Universal access on the other hand suggests cross-subsidizing the low and no profit service areas by high profit service areas. However, this results in the urban population to get over-charged while the rich rural areas benefit from rural subsidizing. So how do we enable a fair and inexpensive network to be able to create access for a large number of people equally? 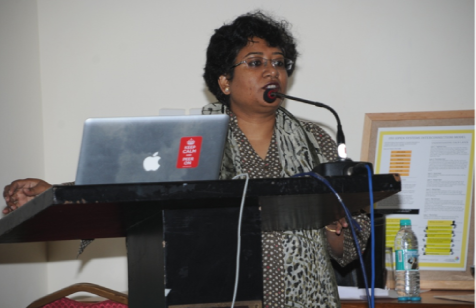 Ms. Archana Gulati went on to introduce the Sanchar Shakti scheme as a contribution to national access in India. It was initiated with the objective of improving rural SHG access skills, knowledge, financial services and markets through mobile connections and involved several stakeholders like NABARD, handset/modem manufacturers, DoT USOF, Mobile VAS Providers, Lead NGOs, Mobile Service Providers. This scheme shows how important is, for the commercial, private and public sector to work together on obtaining accessibility to ITCs. The following session by Pranesh Prakash on Free and Open Internet showed how the internet can still be a restrictive place which does not allow for internet equality. 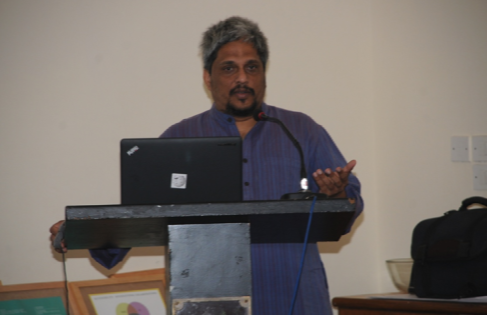 His talk focussed on the concepts of free and open Internet. Prakash started by stating the Freedom of Speech and Expression Article of the Indian Constitution and in an interactive round it was discussed, how these articles are fundamental for securing other basic human rights. This was demonstrated by an example in which the distribution of food did not proceed equally, as misinformation and restrictions led to an inappropriate hoarding of goods. Therefore, it is important for everyone to have that right. In fact, the Indian constitution formulates Article 19 in a positive way, implying not only everyone should have that right, but that the government must promote the upholding of these rights. However, in the case of Article 66a, the law actually caused a problem with freedom of speech in itself, as it penalizes sending false and offensive messages through communication services. This is a massive impediment on free speech, as outsiders decide upon what is offensive and what is false. The other side of freedom of speech and expression is censorship. Online, the removal of websites and editing of content often happens quietly and obscures the fact that someone or something is being censored. Unlike book burnings in the past, which were always made a big political spectacle, often websites are simply removed without a trace, or one is faced with a 404 error, when trying to access it. Because of the offensive content law, journals and magazines are quick to remove supposedly offensive content, as it seems more difficult to engage in argument with the people claiming offense. The CIS proposed a counter-law to secure for this to happen less, as freedom of speech includes the freedom to receive that speech. Next to ensuring freedom of speech and access, the third session of the day focussed on Openness in terms of Open Source software. Sunil Abraham, CIS executive director, stated the importance of free software and open access of data, as they ensure what he called the four freedoms of internet usage, namely the freedom to use for any purpose, the freedom to study, to modify and to share (freely or for a fee). Proprietary software imposes on these freedoms, as it only has restrictive use and a strong copyright. However, there are alternatives that have moderate copyrights, or so-called copy centred perspectives, or even copyleft, including the above mentioned rights into the terms of the software usage. 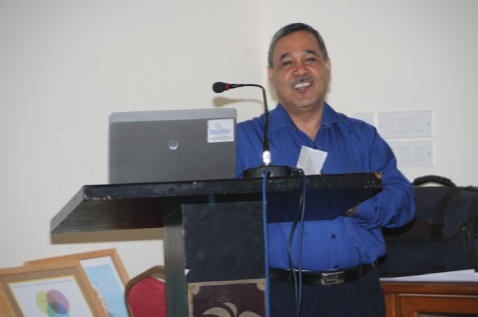 In alignment with Sunil Abraham’s talk Pranesh Prakash criticized copyright law cutting into accessibility rights, as copyright infringements include translation into other languages, audio versions and also integral parts of education. The key is not to have a "one size fits all" copyright solution, as it is impossible to treat twitter content the same as a blockbuster movie. However, the government of India is doing exactly that and needs to interlink questions of access with copyright law. 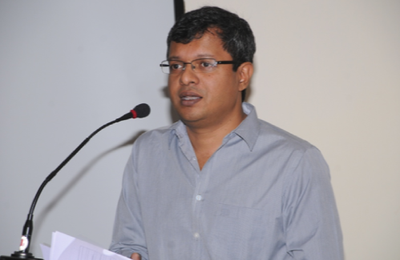 Prof. Subbiah Arunachalam, who led the next session, discussed Open Content. He had seen during the course of his experience India's poor performance in Science & Technology and outlined the reasons for the same. The lack of access to information essential in scientific research and knowledge production, he said, was the major limiting cause. This short session dealt with implications of copyright law on internet access. The participants were divided into two groups, and they were asked build as huge a network as possible with their personal belongings and present their creations. The participants had good ideas. One group placed their mobiles and laptops into the network to have them as nodes. The other group implemented the re-routing around censorship. Given above is a picture of the participants in an activity making the longest network possible with their personal belongings. The following day, June 12th started off with “Privacy” as the theme. 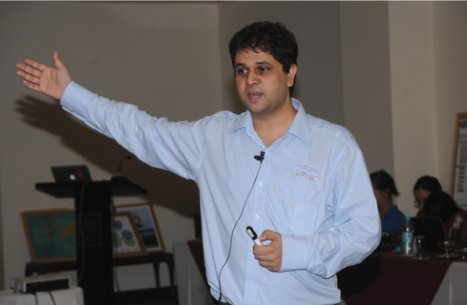 The session Privacy on the Internet in India was led by CIS privacy experts Sunil Abraham and Elonnai Hickock. In an exchange of anecdotes, it was made clear how there needs to be a certain degree of state surveillance to secure the citizens safety. This can happen through off air interception and active or passive cell phone towers that can track mobile devices. However, encryption is an important tool to secure one’s own privacy against cyber espionage. Possible to set up active or passive cell phone tower. The signal strength will be strong and everyone looks for it. Capacity to identify itself as a service provider. Interception can begin with encryption Technology today used by security agencies. Reasonable accommodation (not available or cannot be and requires extra effort and putting up an accessible copy up) and universal Design (for both for PWD’s and non-PWD’s). Web Content Accessibility is operable and easily understandable. Accessibility standards include; Daisy (6 types of books including audio and text books) is all about marking up the documents. Really a good way to read but is expensive and time consuming, also need Daisy tools and player to make it work. In 1808 the first typewriter was developed to help the blind. Overlap b/w mobile accessibility and web accessibility. Example- Raku Raku phone captured 60% of market share in Japan. It has many assistive features. Relay Services has a middle man who passes on the message b/w different PWD’s in many countries, but it is not yet available in India. PWD’s communicating with customer care – the issues involved. Accessibility Policy- very few people are adopting accessible technologies. There is a need to have a strong policy. U.K. and U.S. already have strong policies related to accessible and assistive technology for PWD’s. Gaurab incorporated an Activity into his talk to enable the students to have a clearer understanding of International Bodies and Mechanisms. Virtual yet real space and most important question to be understood is that whether, the governance of internet is possible? India’s Outlook in internet policies-Pillars of Internet which is not fully addressed by the Indian government today. Established an Inter- Ministerial Group by including various government departments into the arena. Making policies in India is difficult because the population is huge and implementation at rural level is difficult. Bombarded by Techno utopians- who believe in technology’s ability to change lives. Techno determinants- Corruption solved through technology through open government data. More technology is better, the most sophisticated ones are the best are gross misconceptions. Bhoomi project tried to deal with corruption at village level. Important policy change made all paper work illegal and digitized the land records etc. every action and request will be logged. But this led to creation of new corruption. Bribes were taken even before data was logged! UID Project (Cobra Post Scam) around 20 public sector and 30 private banks were involved in money laundering scams. People who design the systems in Delhi prepare sub-contracts. The sixth day of the Institute kicked off with Nishant Shah, director of research at CIS, looking into Critical Perspectives of the Internet. Nishant made a very important distinction between the internet as infrastructure and as social network constructing alternative universes. Nonetheless it was important to stress that technology should not be alienated in the process of this separation but seen as an integral part of it, as the digital is as much part of reality as any other technology and has become essential as a technology of change that it brings about not only in scientific but also in social development. Quoting Michel Foucault, Shah argued that technology becomes influential when it changes life, labour and language, which is why research in the field should involve critical ways of thinking about body, space and community. 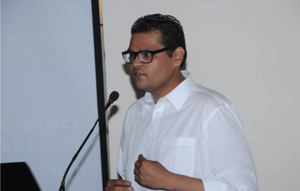 Above is a picture of Dr. Nishant Shah speaking on Critical Perspectives of the Internet. The body perception can be perceived through the way bodily agencies change through technology. Technology does not necessarily taint or corrupt the body, but can also be a way to escape its confines. To put it to a point, we are all born into technology and cannot free ourselves from them, as for example pregnancy already starts with nutritional supplements, regulatory diets and exercise and essentially ends with birth technologies that do not necessarily involve only the digital - we must remember, speech is one of the oldest technologies available today. 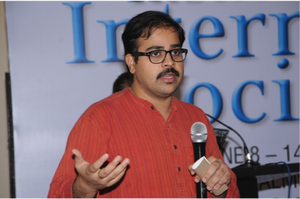 The second session on “Strategies for Policy Intervention” was led by Chakshu Roy. This session dealt with various ways in which policy intervention can be made and the various factors necessary to successfully engage in policy forums. Satyen Gupta during his talk on “Profile of Internet Service Providers” discussed the nature, offerings and profile of various ISPs in India, their market share and dynamics. National Internet Exchange of India (NIXI) -National Internet Exchange of India (NIXI) has been set up on recommendation of TRAI by DIT, Government of India to ensure that Internet traffic, originating and destined for India, should be routed within India. Helani Galpaya during her talk on “Competition in the Market” discussed about what competition meant, Herfindahl–Hirschman Index to measure how competitive a market is, what are the dangers of monopoly markets and the landscape of the Telecom market in India. The final day of the Institute focussed on how the Internet can be used to effect change on society – Activism was the theme. Target Omar Abdullah. It is about an act called Administrative detention Act. One can be detained without act i.e. The Preventive Detention Act. He directly responded to the threat. Twitter seems to be a place where the political leaders are actually accessible. This kind of access was not possible in day to day life earlier if one was a common man. This phenomenon is developing. Even in Corporate setup writing a mail directly to the CEO seems possible. Strengths: Wide reach, Freedom of speech, Data collection is made easy, Issues can be tackled swiftly, Global communities, singular identities have lot of power. Eg: 190 Million people stood up against Poverty; this kind of mobilization impossible without internet. Besides local issues even Global issues are addressed an collection of funds becomes easy. Onion.com once a struggling publication in U.S., but now with a global audience it is thriving and it has a healthy reader base today. The Earth Hour helps people connect across space and time. Weakness: More popularity, more attention; Traditional/Real Protest has become rare and a threat; There is no real action beyond internet, threat of movement is low, there is no real commitment involved in digital activism and just one click is enough to make one ‘feel good’. Opportunities: Recruitment of protestors for real protests. Diff. b/w real and virtual blurred; anything that affects the mind space is real. The intersection is interesting. Threats: Total removal of privacy, Government intervention in private issues and there could be misinterpretation of people’s thoughts by certain people. Traditional vs Digital activism: Traditional fails to provide results whereas clicking a button is as easy as wearing a badge. Facebook activism: ‘Like Buttons’, People moving away from reading emails, a shift towards use of facebook; creates a sense of belongingness which the traditional activism failed to achieve. India against Corruption: used mobile phone effectively. Social Media has changed the way protests happen globally and in India, one example is Twitter. Change.org is a website which gives freedom to anybody to start a petition without any external source; Awaaz.org another such petition website. Green Peace launched a Green peace X which was a runaway success. YouTube is another platform for the masses. People today are more interested in watching rather than reading. Pakistan in 2007: “Flash protests”; Free Fraizan Movement on Twitter. Something to keep in mind regarding while launching a campaign online is to think who the audience is and what we want them to do and how will the campaign help our objectives? How to measure success of a social media campaign? Engagement- likes, tweets, comments, etc. The next session on “INTERNET ACCESS” ACTIVISM by Parminder Jeet Singh dealt with how people can contribute to initiatives for improving internet access amongst masses. The last session on “Ensuring Access to the Internet” by A.K. Bhargava discussed strategies to enhance access to the Internet in India with special focus on National Optical Fibre Network. - Policy Aspiration of Broadband - How do we meet aspiration? 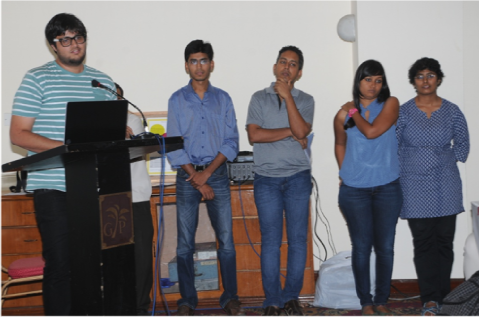 The participants presented their assignments which were given to them to work on the 3rd day. The participants were presented with Wikipedia T-Shirts as a token of appreciation. All participants were asked to fill a "Session Feedback Form" for each of the sessions and also an "Overall Feedback Form". They were also constantly encouraged to come up with suggestions and inputs on how to make the Institute more interesting. 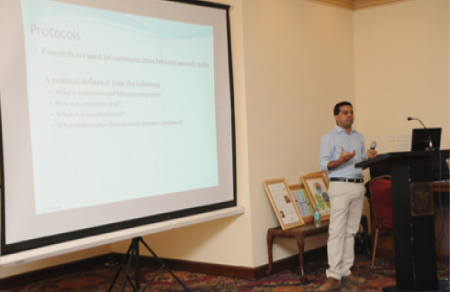 1 Presentations – Participants felt sessions with accompanying slides/aids were most helpful. Some felt that accompanying notes could also be useful for future reference. 2 Use of Examples/Case Studies – Participants felt concepts can be better assimilated if case-studies/examples are used. Some also felt that for the technological advancements discussed, it would have been better had the social/economic impact of the same was discussed too. 3 Implementation Gaps– One participant, who is working at the field level in Kolkata had a specific thing to say about the talk about BSNL and its offerings– Although BSNL has so many options available on paper to connect to the Internet, common service centres in West Bengal are mostly run on Tata Indicom’s network even though the board outside says “BSNL” etc. She felt that the reality is far different from what exists on paper. 4 Interactive sessions were most appreciated than speaker led sessions. 9 Assignment – Participants felt that the assignments were good but they needed more time to work on the same. The food and the facilities were enjoyed and appreciated by all. The remote location of the Golden Palms Resort was a concern for most of the participants. Participation Certificates (template shown below) have been mailed to all the participants in the third week of July 2013. 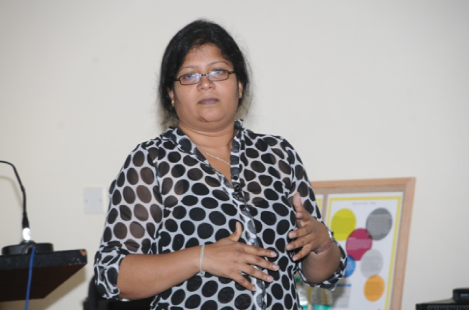 Preethi Ayyaluswamy – “Would help me in strategically planning for an online campaign” (On digital activism). 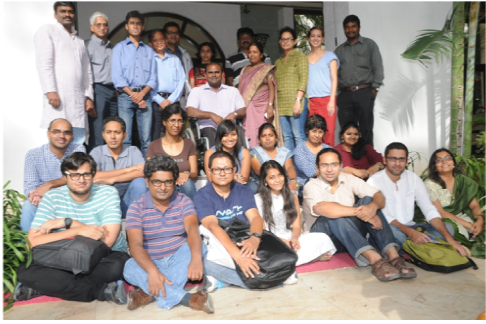 The Institute was highly engaging and enabled the participants to explore the various facets of Internet & Society. As was evident from the feedback forms, participants had given thought to contributing to Wikipedia in their mother tongue, take the knowledge to the field work that they are associated with, continue with their research, change their Internet connections, help file RTIs, adopt more open source software, sharing with students, advocacy efforts etc. There was a very high level of expertise amongst speakers at the Institute which was apparent from the participatory discussions and a lot of insightful perspectives were brought forth. There was a common consensus amongst all participants that inclusive growth across all dimensions would take efforts from all stakeholders. We hope to learn from the findings of this Institute and work towards a better second Institute.